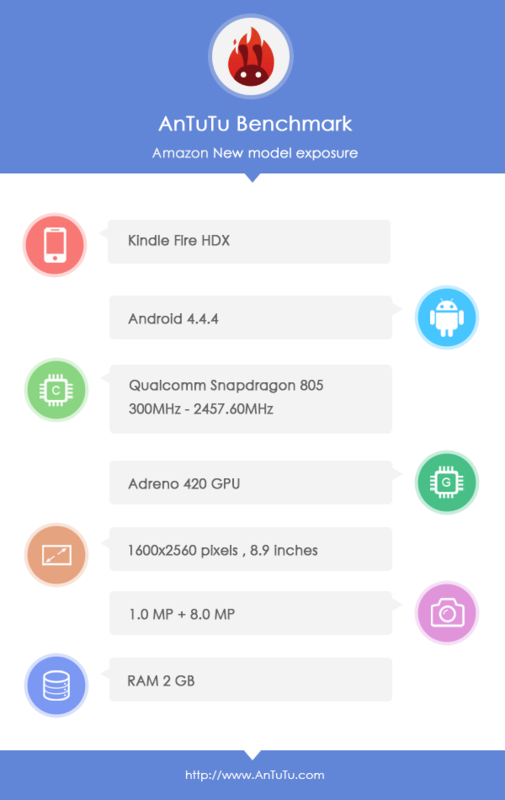 The benchmarking site Antutu revealed this morning that they have discovered the first evidence of Amazon's next tablet. A new set of benchmark test results were posted to the site which describe an 8.9" Kindle Fire tablet with a Snapdragon 805 CPU, suggesting that the new tablet is going to be a slight upgrade to the existing model. The current Kindle Fire HDX 8.9 sports a Qualcomm Snapdragon 800 CPU with a clock speed of 2.2GHz. It ships with 2GB RAM, 16GB internal storage, an 8MP camera, and a screen resolution of 2560 x 1600. According to Antutu, the new model will keep the screen resolution, RAM, internal storage, and cameras, thus eliminating most of the reasons to upgrade from the current model. 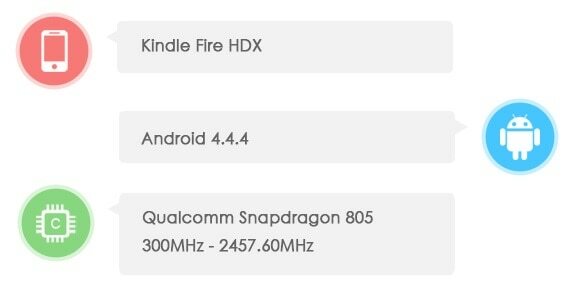 But the site also reports that the new Kindle Fire 8.9 will have a slightly faster Qualcomm CPU. The benchmark results mention a quad-core Snapdragon 805 CPU which runs at 2.5GHz. From what I can find online, the SnapDragon 805 has a newer chipset and an improved GPU, making it faster all around. There is of course no news yet on the launch date or list price for the new tablet, but we still know more today than we did this time last month. And for that, I would like to thank whoever at Amazon reads this blog. Three weeks ago I asked why we weren't seeing any new rumors or leaks about Amazon's next tablets and now Amazon has responded. I'm kidding, of course, but I did have a point a few weeks ago when I wrote that there was a marked lack of rumors or leaks concerning Amazon's next tablet. Today's leak is the first evidence of any kind to suggest that a new tablet was in the works. And now that we know it exists, it's safe to suggest that it should launch in September or October. I would also not be surprised if the new tablet was thinner than the existing Kindle Fire HDX 8.9, though of course that is pure speculation. Not sure for how long that chip will be relevant though, the 810 (4xA57+4xA53 with cat 6 LTE on 20nm) should be a huge step forward and was supposed to arrive next year but recently Qualcomm said it will “launch “this year. Hard to say if launch means ship or in actual devices but i do wonder if the new Nexus phone won’t be the first to use it and then the 805 will be outdated . Thanks. I hadn’t found that yet.